Before going into the discussion it is necessary to discuss some of the major parts of basketball hops which are backboard, net, rim and a pole. Pole is fitted with the help of cement. You can install it anywhere you would like to play daily which can be your home or any ground etc. All the basketball Systems are adjustable, that means you can set the height as you need. You can adjust the height for the kids as well. The height is usually between 7.5 to 10 feet. After getting a glace on its major features, we will introduce a list of the best possible In-Ground basketball hoop Systems along with its impeccable features, have a look! The lifetime has made an exceptional reputation for their fabulous in-ground hoops which are constructed from rust- resistant, UV-backboards and powder coated steel. It is guaranteed that there will be no fading, no yellowing and no rusting. 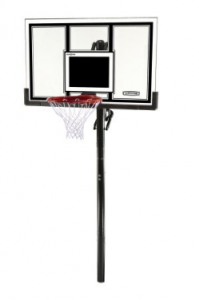 The lifetime 71252 in-ground basketball System is designed for rough and high-intensity play. It is an In-Ground Basketball Hoop System, which has a 54-inch pro look backboard made of athletic Makrolon Polycarbonate for Shatterproof action. The backboard raises and lowers easily, the vibration works very well and all parts are assembled properly. Power lift height adjustment technology raises or lowers rim 7-1/2 to 10 feet in infinite increments. Simply one can say that the height adjustment of the goal is very easy; you just have to squeeze the handle. The life time 71525 is fixed in ground with cement for protection. It has the Power lift height adjustment mechanism. It has a weight of 40.3 kg. Five years limited factory warranty for US and Canada. The Spalding NBA was established by Boston Red Stocking pitcher A.G. Spalding in 1876. Spalding has been a leader of quality and innovation for many years in the sporting goods category. The model number of Spalding is 88454G, which is known as being the best, and what the others could only aspire to become. 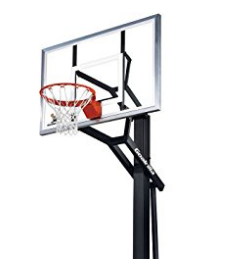 The Spalding 88454G, is an In-Ground Basketball hoop System that has a backboard of 54 inches, 2-piece 4 inch square pole, ground sleeve anchor System, Pro-image breakaway rim and U-Turn pro adjustment mechanism. 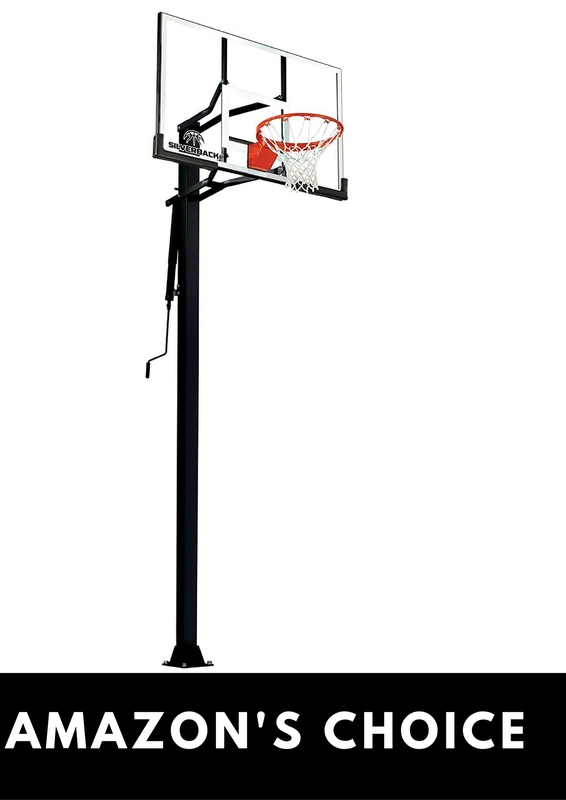 The 88454G NBA, 54 inches In-Ground Basketball System is an athletic, durable and reliable product with the professional appearance. The square 54” glass backboard is lined with a steel frame to make it sure that you can play in aggressive weather conditions. The steel frame backboard won’t get damaged in intense weather conditions. The U-lift System from Spalding allows for an easy height adjustment from 7.5 feet to 10 feet. Board size is 54 inches. ¼ inch thick tempered glass backboard allows exceptional rebounding. Ground sleeve anchor System allows for easy installation. Pole is made of steel. The silverback In-Ground Basketball System is a 60 inch Best In-Ground Basketball Hoop System from silverback. It has a two piece pole, 60 inches tempered glass backboard, an anchor pole System, and steel actuator System for height adjustment. The height of a goal could be adjusted to 10 feet. The minimum height you can adjust is 7.5 inches. Anchor System allows for mobility and poles are made with a powder coat finish. It has a backboard of 60” x 33”. Its frame is made up of aluminum and has a tempered frame of 8mm perimeter. Its build quality is great and anchor System is best for those who would like the option to move there in ground hoop to another location. It has an anchor kit, backboard pad and pole pad. It has 60 inch tempered glass backboard. Adjustable height from 7.5 feet to 10 feet. It has a limited warranty of five years. The 71281 is an In-Ground Basketball Goal System which is made of powder coated steel and 52”UV protected shatter proof Makrolon Polycarbonate backboard. Makrolon Polycarbonate makes the backboard stronger. The frame of a backboard is made of steel which improves rebound and rigidity of a backboard. It has a power lift adjustment with the help of which one can easily adjust the height with just the squeeze of a handle. It can adjust height from 7.5 feet to 10 feet. It also has a Slam-It Pro Rim with all-weather nylon net and a 3.5” diameter round steel pole. 52”steel framed shatterproof backboard is made of polyethene for strength and durability. Slam-It Rim comes with a regulation diameter, 18-inch Slam-It-Rim, and weather white net. Steel metal net hooks are welded to the rim, no plastic clips are used. Its pole is 3.5-inch round. Power lift height adjustment mechanism. It has a 5 years limited warranty. The In-Ground Basketball Hoop with tempered glass backboard is an amazing buy for basket lovers and players. The silverback In-Ground Basketball System with tempered glass backboard weighs about 150 pounds while its shipping weight is 230 pounds. The whole basketball System is supported by two pieces of steel poles which have a cross section of 4 by 4 inches. These poles are protected from rust by Dupont powder coating. It has a breakaway rim which is adjustable from 7.5 feet to 10 feet. It is very easy to adjust. It has the ability to withstand during shots, layups and even dunks. Its user will not have to worry about the rim that it will break with extensive power. It Comes with a 54-inch tempered glass backboard. Its breakaway rim provides support and stability when dunking. Massive 5×5 inch one-piece pole for rock-solid play. DuPont corrosion resistant paint at the base of the pole protects from rust and corrosion. All steel actuator easily adjusts the goal from 7.5 to 10 feet. It has anchor bolt mounting System, offering stability of concrete with the option to move your System. Lifetime in ground hoop System is constructed of UV protected, high density polythene plastic and powder coated steel to resist the rusting, fading, chipping and cracking. 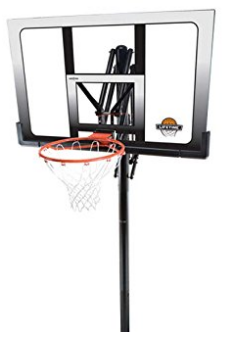 This in-ground hoop comes with a 50-inch shatterproof backboard with orange Slam-It-Rim and action grip height adjustment feature to raise or lower the backboard according to one’s need. It adjusts from7.5 to 10 feet high. It also has a manual scorekeeper that keeps the track of the score. It is designed to withstand any kind of weather condition. It has 18-inch orange Slam-It Rim made of 5.8-inch solid steel with ½ inch steel brace and double-compression spring is built to take a slam. It has 3peice powder-coated steel round pole. The Spalding was founded in 1876, by Boston Red Stockings pitcher A.G. Spalding and his brother, J. Walter Spalding. Since 1876 the company has been developing innovative products. 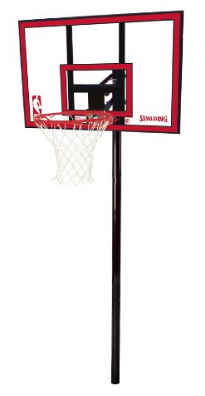 The Spalding In-Ground Basketball System has a 44” steel framed polycarbonate backboard for exceptional durability. The backboard has 16” offset from Pole. The ratchet lift System allows adjusting the rim height from 8 to 10 feet. It has a three piece, 3.5” round steel pole System allowing maximum performance during the game. The System includes a ground sleeve for easy installation and removal. It has a 44″ polycarbonate backboard with steel frame. The backboard has 16″ offset from the pole. Ratchet lift System adjusting height from 8 to 10 feet. Has a slam jam rim for recreational level of performance. Ground sleeve anchor System allows easy installation. This in ground hoop promises to be one of the most durable products in the market. The Goalrilla is famous for its high quality gaming products. The GS54c is the most compact in Goalrilla line. With the GS54c you can get superior visibility and consisting rebounding across the glass. The Goalrilla GLR GS 54 basketball System can be mounted easily. It is consisted of the backboard, 54 by 34 inches in size and is made of tempered glass, anchor bolt mounting System, 1 piece 5” x 5” pole and powder coating finish. The pole is made of solid steel, which makes it quality sturdy. With the help of Goalrilla height adjustment actuator, one can easily adjust the height of a goal. Its best feature is its solid structure with its compact basketball System. If you are considering move, so with the help of anchor System you can move the hoop as you required. You do not need to worry, want to change the home? You can easily carry it with yourself anywhere. The System is safely transportable. 54 inch tempered glass background. Adjustable height with Goalrilla height adjustment actuator. It has Goalrilla flex rim and anchor bolt mounting System. One piece solid steel pole with powder coating finish. All instructions of installation are clear and easy to install. It has tempered glass backboard. 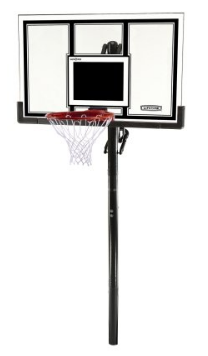 The Lifetime 90020 is Best In-Ground Basketball Hoop which have a 48” shatterproof fusion backboard. It has an action grip height adjustment mechanism that adjusts from 7.5 to 10 feet high in 6” increments. It has rust resistant powder coated pole and all-weather nylon net make this suitable for indoor and outdoor use. It has 18” slam-it rim, built with A 5/8-inch ring of solid steel with ½ inches steel braces and double compression spring lets you like a pro. Slam-It-Rims come with a regulation diameter, 18-inch black classic rim and all-weather white net. Double rim compression rim holds up well to aggressive play. Steel metal net hooks are welded to the rim. No plastic clips are used. Rust resistant powder coated pole and all-weather nylon net. Amazing one hand Action grip height adjustment. It has 48” shatterproof fusion backboard with the Makralon playing surface. Pole cap included preventing rainwater from getting inside pole. 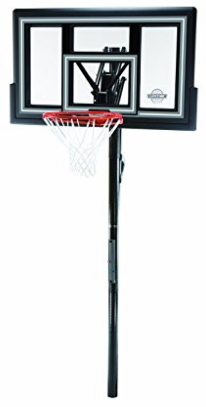 Slam-It-Rim comes with a regulation diameter, 18-inch black classic rim, and all-weather white net. It has a five year limited warranty from lifetime products. Lifetime’s 3.5″ round basketball ground sleeve will provide you the rigidity of in ground System and allows easy removal of base pole from cemented section. Only slip the pole into the ground sleeve, and a locking tab will secure it into places. To remove pole, just remove the locking tab and slide the pole out. It fits 3.5” in-ground round pole System. The steel construction is powder coated. For installation, Cement is required. This was a list of the best possible In-Ground Basketball Hoops compiled and presented to the best of our knowledge after a deep and thorough research of the different companies providing such products. We have deeply assured that this article helps you in every regard while choosing the best In-Ground Basketball Hoops suiting all your needs and helps you in playing smoothly and efficiently, still if there are any other models which we might have missed you can always mention them in the comment box below.